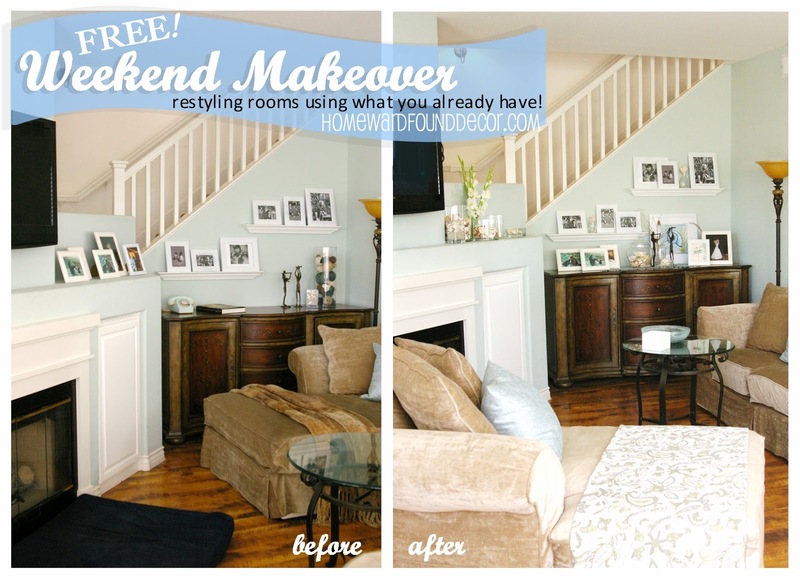 Welcome to Part 2 of my FREE Weekend Makeover! that all of the home improvement & decor shows do on HGTV? I don't have a bus. Or a bullhorn. I am going to welcome you via photos! with the kitchen beyond and the dining area on the right. Today, we're just focusing on the Living Room. One end of a massive modular sofa blocks the living area from the kitchen area. and I noticed that people would gather in the living area. And the dining area. And then other people would lean on the back of this sofa between the rooms. So my plan was to take this closed-off room and just open it up. What you see in the same view now is the end of just one section of that sofa. It sits back against the wall, leaving lots of space for people (and dogs!) to move between the rooms. A basket sitting here adds extra storage and serves as a place to sit a drink or book. Looking left, you see more of the modular sofa. It filled the whole room! 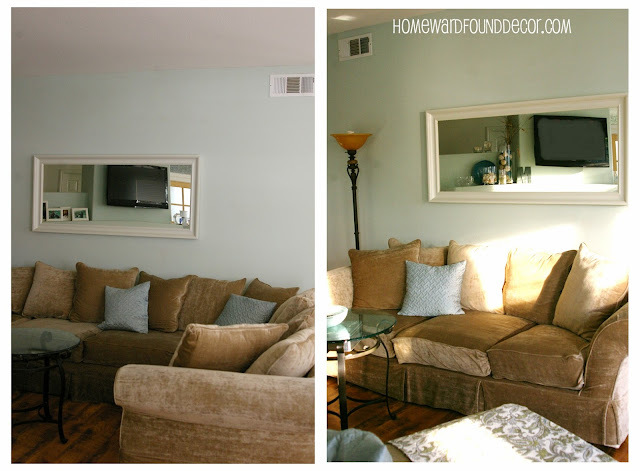 The mirror above it looks too small in comparison to the sofa's size. Now the longest section of the modular unit sits against the wall, like a normal sized sofa. in front of the sofa for people to walk into the room and sit down. 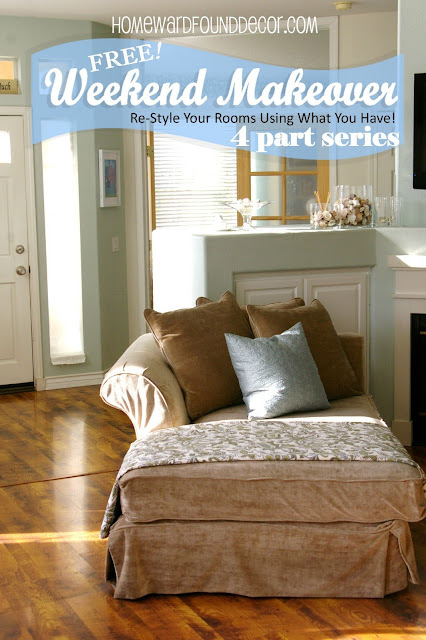 with a chaise section sticking out into the room. Yes, it was comfy. But it was really only usable for one person at a time. The chaise section has been moved to another position, leaving plenty of space for access to the buffet. And the buffet is now family photo central, as well as some art and part of a lovely crystal collection. All of the crystal was stored inside the buffet... hidden away because it was 'too formal'. I pulled the pieces out and filled them with seashells. When the late afternoon sunlight hits them now, they sparkle and add life to the room. with a silver one with a big white drum shade. It would have blended into the room more. But we're working with what we have here! unless you were sitting on the chaise right in front of them. but it stayed right there. I do not mess with the family dog's favorite place to lay! The photos were consolidated to the buffet and shelves over it. 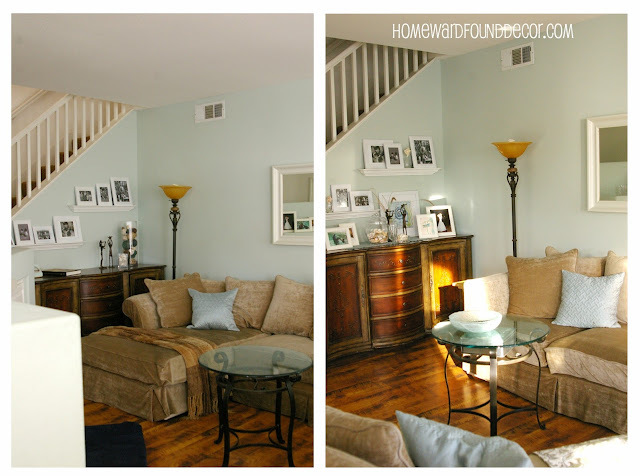 was placed behind the photos to add some color, and to echo similar art across the room. The fireplace 'wall' is a large area with storage, the fireplace, a mantel, and the tv. back behind this blue one and adjacent to the stairwell. I wanted to turn the whole thing into 'the mantel' and give it visual presence in the room. Clear glass vases were gathered up and filled with seashells. I also used the tall vase with colored items in it from the buffet in the last 'before' image. Grasses growing in the front yard were cut to add some height and repeat the brown of the sofa. A crystal bowl and a metal letter add more texture. FIRST place a smaller glass vase INSIDE the large one - upside down. It will help fill the space and require less small items to complete the look! things don't always work out the way I plan. Making changes as you go is part of the process, so plan on that in your own home. 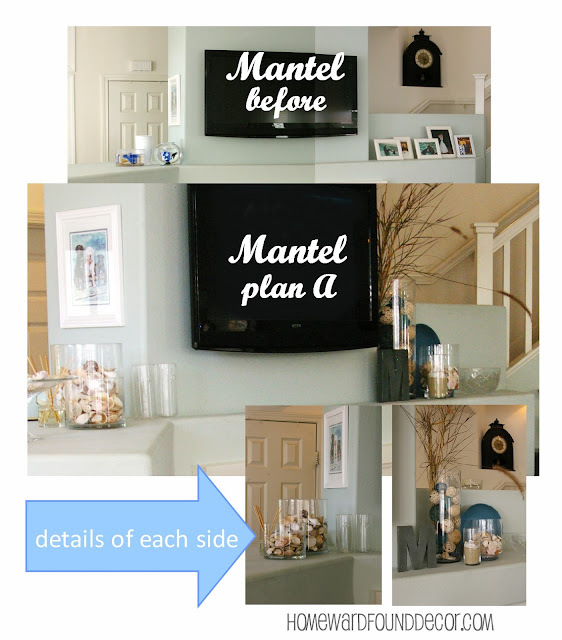 I staged the mantel as described and shown above, and then took photos. Later, I decided that I really didn't LIKE the way it looked! Here's the 'Before' shot, and the first way that I arranged it. while the shorter vases on the left side just didn't have the visual weight to make an impact there. I placed the tall vase on the left side, and the smaller vases on the right. I also brought in the armillary garden sphere from the garage to add more texture to the right side. there is a lot going on visually on that ledge to entice you. See those white gladiola flowers? That is the ONLY thing that I bought for this makeover. I spent $3.99 for ten stems at the local grocer! You can see in this photo how the large modular sofa section stuck out into the room. 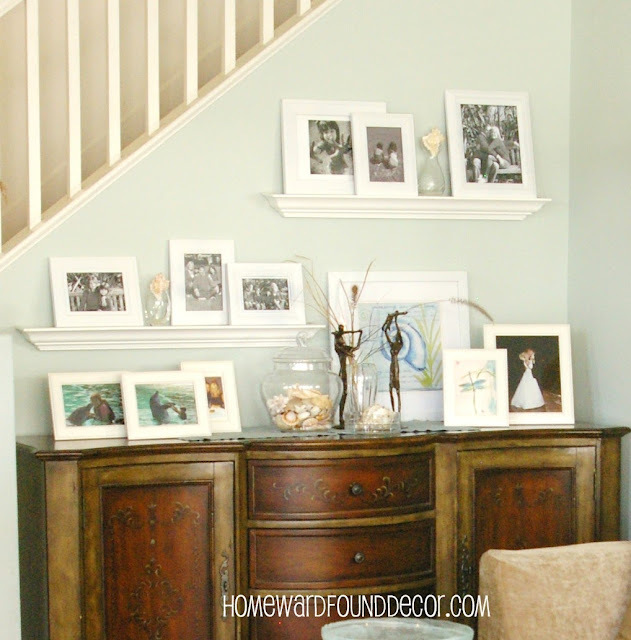 And the mantel / ledge thing was basically a catchall for mail, backpacks, etc. The chaise section of the modular sofa is placed here, and angled to match the angle of the fireplace. It directs your eye to the fireplace. It brings an energy to the room. and talk to others in both the living room and the dining room! 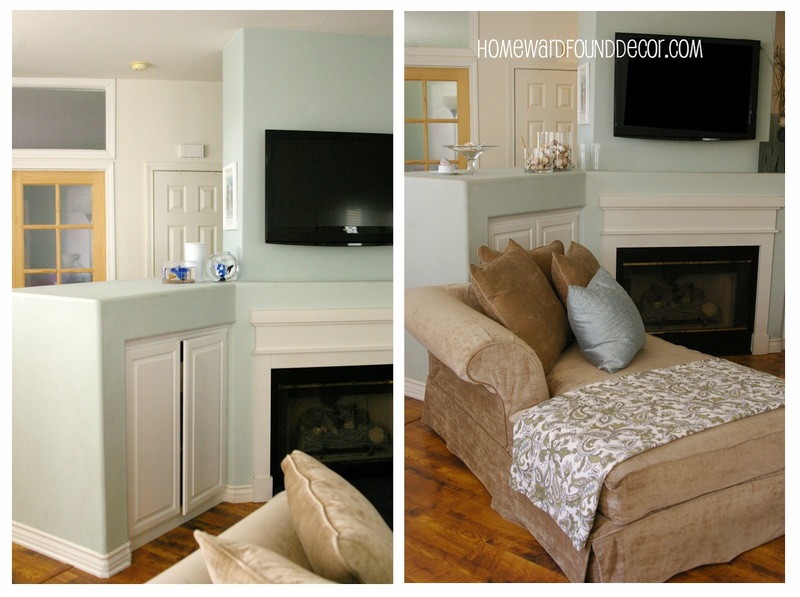 It opens the space up because there is no arm jutting into the room.... just a low, open seating area. The fabric lying across the end of the chaise is simply a tablecloth found in a drawer. 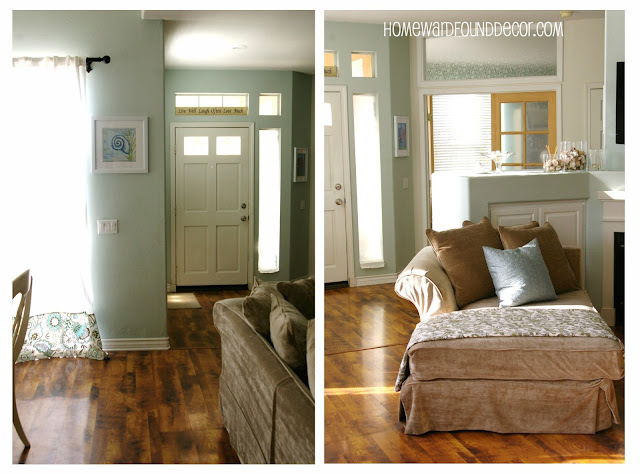 It matches the curtains & placemats in the dining room, so it pulls pattern and color across the space. It could serve as a throw if needed, but it's summer... so it's just an accent. This is why I say don't think of any thing you have too literally! A tablecloth is just fabric... use it on a window, or hang it on a wall, or use it as a throw. Here's another view, looking from the kitchen back to the front door. but the room feels twice as big. 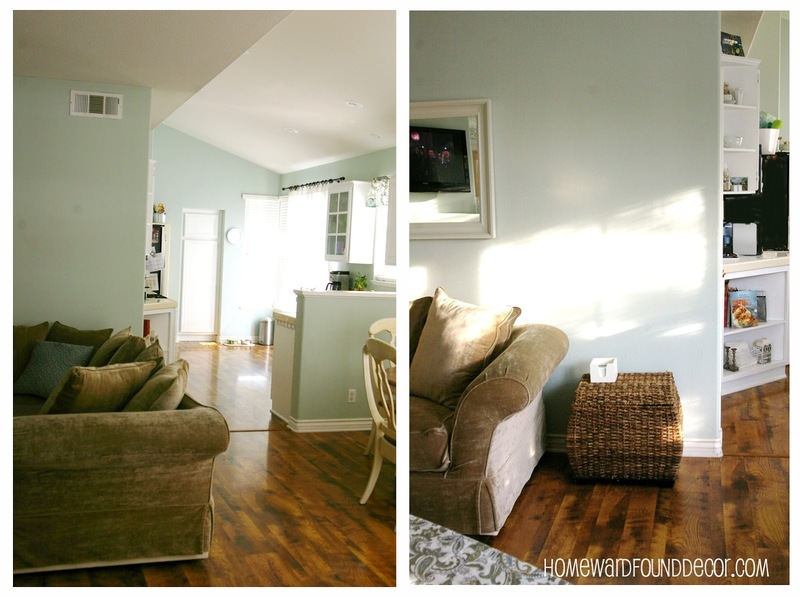 With a wider expanse of the floor showing, the visual effect is of more space. I know you are going to ask "Where is the other modular sofa section?" It's coming up in the next post! but she never thought of pulling it apart and using it as separate pieces. When I did that, her perspective changed! So can yours. Shove your furniture around. Take some out of the room. 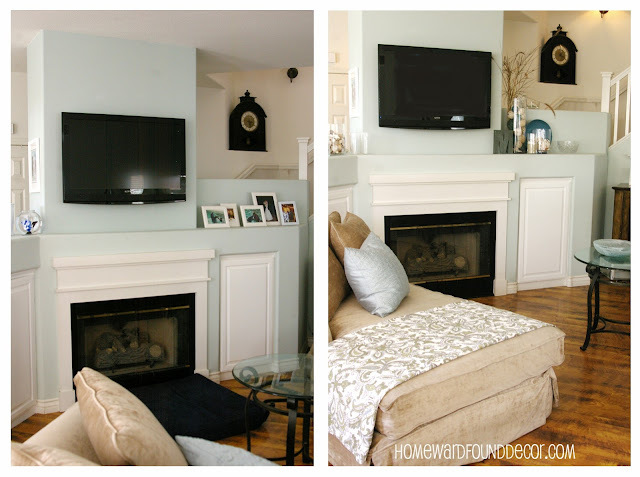 Clear the mantel and ledges, and then start playing with new elements there. Move them around. and two pieces from the china service lift one special shell up like a trophy. and the afternoon sunshine just brought them all to life! Before, this darling vintage blue phone sat on the buffet. You didn't even SEE it in the before photos, did you?! 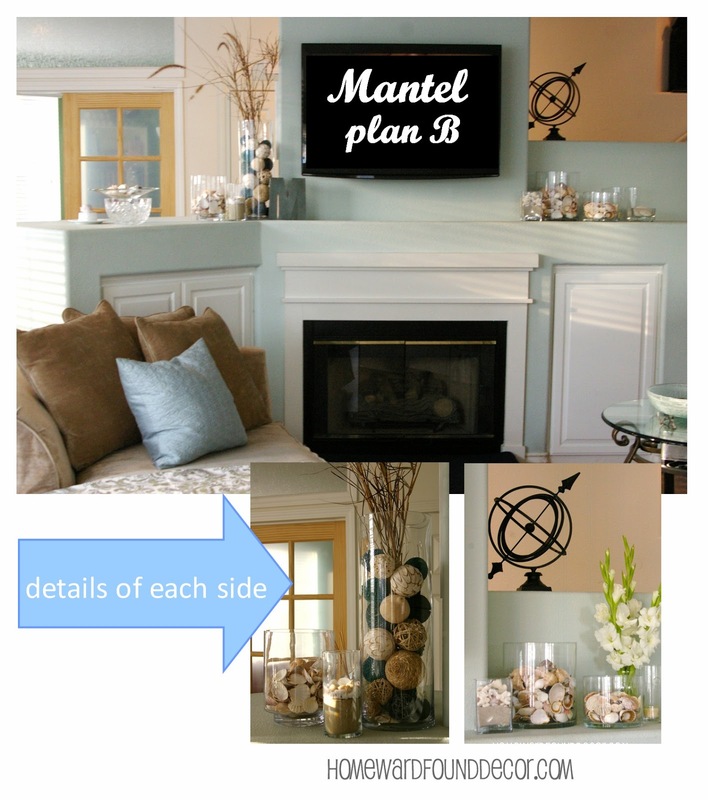 plus I can tell that it inspired the paint color (Glidden 'Gentle Tide') . to welcome this family and their guests to their home. And that's what decorating with what you have is all about! View Part 3 of this makeover ! This is such an inspiriting makeover! :) Not very many, I'd guess, Sylvi! Especially one with a dial! hey! just curious how you made the long portion still have an arm rest after you took off the chaise section? The original sectional created a huge 'L' shape when all together - actually, because of the chaise on one end, it was more of a 'U' shape. When I removed the chaise on the left end, it became an 'L' - and the new end section had no arm. THEN I removed the two sections on the right end (they went into the dining area, shown in another post), I was left with a corner piece that had the solid back on TWO sides of the square section - because it had formed the corner of the 'L'. Are ya' with me so far?! I moved that section to the left end of the room - which was now the left end of a 'regular' linear sofa. I turned it 90 degrees left, so that what was the solid back against the wall before was now the 'arm' at the end of the long sofa. It's not the same rounded arm that is on the chaise, but it still provides support.